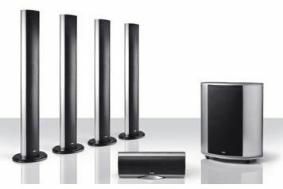 Teufel's floorstanding 5.1-channel cinema system | What Hi-Fi? The CL90FR speakers, used for the front and rear left/right channels, additionally have an extra pair of bass drivers. The CL900SW subwoofer has a pair of vertically stacked 20cm drivers, powered by a 250W Class D amplifier, in a slim cabinet just 25.6cm deep. It delivers bass down to 38Hz. The package is available direct from Teufel's website, and comes with an eight-week return and exchange policy, a twelve-year guarantee on the speakers and two years' warranty on the electronics.